He left out the "Why", as in why am I doing this. Especially since he's had a net loss for the past two years. Too good to be true comes to mind. Not that it won't happen, just that there's a hidden cost down the road. Ad Muncher is not just an ordinary run of the mill ad blocker so that's what makes me suspicious - when something extraordinary becomes free. Unless V5 is going to more directly compete in an arena where everything in its class is currently free. Or maybe the guilt of asking people to pay for this really did hit the breaking point. Either way, I do hope development can continue because I've become spoiled by it. P.S. He needs to shut down the Buy Now within 30 days though. Imagine someone spending $110 on a single license at this point - not being aware of the plans. rkh wrote: He left out the "Why", as in why am I doing this. Especially since he's had a net loss for the past two years. Some people are showing there support by renewing their licenses! max wrote: Some people are showing there support by renewing their licenses! I don't think it's very fair for you to leave out the part where you're making the program free, you should at least inform people. Luckily he's my bro and I've already updated him on the details. Others might not be as fortunate. I love the fact that this great program is going to be free, I am 72 and have been supporting this great program for years now, my license has run out and I am out of luck. When will this happen? When will it actually be free, as you announced 1 month ago? Just wondering if you can give us an idea. Bunch of bullshiters. Very disappointed in the way you are handling this matter. Here's an Email I received on July 18th. 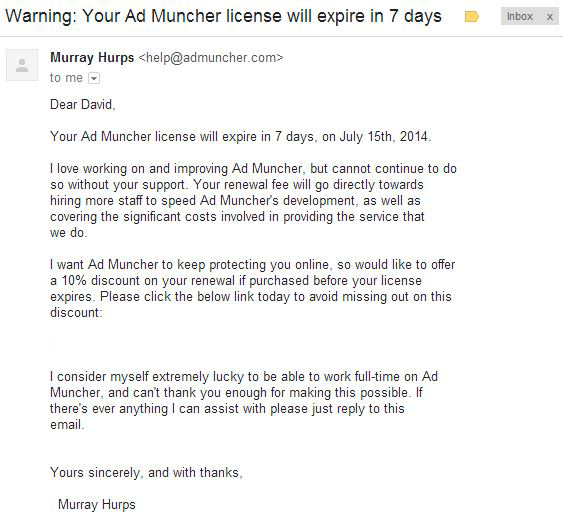 Your Ad Muncher license will expire in 7 days, on July 26th, 2014.
that e-mail makes perfect sense since the free version isn't out yet. Jeff wrote: that e-mail makes perfect sense since the free version isn't out yet. I'm sad to see that your Ad Muncher license expired on July 26th, 2014.
to offer a 30% discount on your renewal to help get you back on board. please just reply to this email. This has become a joke. It not joke long ago?!?! ?